The pioneer climate modelers Kirk Bryan and Syukuro Manabe took up the question with a more detailed model that revealed an additional effect. In the Southern Ocean around Antarctica the mixing of water went deeper than in Northern waters, so more volumes of water were brought into play earlier. In their model, around Antarctica “there is no warming at the sea surface, and even a slight cooling over the 50-year duration of the experiment.” (4) In the twenty years since, computer models have improved by orders of magnitude, but they continue to show that Antarctica cannot be expected to warm up very significantly until long after the rest of the world’s climate is radically changed. Bottom line: A cold Antarctica and Southern Ocean do not contradict our models of global warming. For a long time the models have predicted just that. (1) National Academy of Sciences, Climate Research Board (1979). Carbon Dioxide and Climate: A Scientific Assessment (Jule Charney, Chair). Washington, DC: National Academy of Sciences. (2) Martin I. Hoffert, et al. (1980) J. Geophysical Research 85: 6667-6679. (3) Stephen H. Schneider and S.L. Thompson (1981) J. Geophysical Research 86: 3135-3147. (4) Kirk Bryan et al. (1988). J. Physical Oceanography 18: 851-67. For the story overall see Syukuro Manabe and Ronald J. Stouffer (2007) Journal of the Meteorological Society of Japan 85B: 385-403. Thank you. This was most timely. yes, thanks for that, well written. Thanks for the article, all useful ammunition to argue against the sceptics, though to be honest, it doesn’t seem to matter what arguments you employ, they are rigidly committed to their point of view “that’s exactly what you would say about the Antarctic, very convenient, but it doesn’t convince me” . It’s interesting that the Arctic ice area at the moment is more nearly back to normal after its alarming summer loss last year. Of course, the ice being only one winter ice, it might melt back very quickly this spring, it will be very interesting indeed to see what transpires. But basically, if the summer ice does go quickly, which is what a number of scientists are predicting, and I thought was likely, we are going to see a very different world shortly, a planet of two halves, a quickly warming north, and a much colder south. Are there any predictions as to how quickly the North Pole area will heat up once the summer ice as gone and what sort of maximum temperature we could reach, say, 20 to 50 years after this event? Have the latest climate models taken into account a possible early loss of Arctic ice, by say 2013, and if they have, how do they differ from the previous ones? So as the ice melts and there is more water in the oceans, there will be more water to heat up slowly and it will take even longer for people to realise what’s going on? This is off topic, but I am curious. The stratosphere is colder now, and if the polar vortex brings that colder air down to the South Pole, wouldn’t it be colder at least when the polar vortex is happening? Thanks for that explanation. Could you add a few words explaining why, in contrast, the Antarctic Peninsular is warming rapidly? I need to get this straight. Are you saying that the latest models predict that the Antartic will actually cool as opposed to simply warm more slowy? If so, what is the mechanism for the predicted Antartic cooling? Intuitively you would think that the oceans would simply slow the warming. [Svet at #9] – I think the ozone hole, and atmospheric circulation changes that occur as a result, is implicated with this, but I have not read enough about it to be sure. Consequent to this, I did hear that Antarctica would experience a catch-up when the ozone hole recovered, but that the current generation of climate models could not predict that because they do not model the stratosphere properly. M. Ken (6) — Click on the Start Here link at the top of the main page. If that is not enough, read The Discovery of Global Warming, the pages being linked first in the Science Links section of the side-bar. Slioch (8) — I’m but an amateur here. I’ll opine that inside (south) of the south polar vortex it is quite cold, but that the Antarctic Pennisula is now outside (north) of it due to global warming. It may be worth emphasizing how important this prediction of slow warming of the Southern Oceans is for the evolution of the ice sheet. Warming of the waters underneath the ice shelves and the melting of those shelves is a central concern of glaciologists worried about the stability of the West Antarctic Ice Sheet. Could models be underestimating the amount of heat that will be mixed by ocean eddies across the Circumpolar Current from warming waters to the north? I hope not, but it’s something to monitor very carefully. Our understanding of those mixing processes is far from fully satisfactory. This is fabulous. Now we can deny falsifications of the models at least 50 years on. Good for us! Let’s see. The heating of the oceans from warmth in the atmosphere will be stored in the deep oceans (where you can’t measure it?) so the warmth of the atmosphere will not occur. That’s logical. But which warmth will then go to the deep blue? Don’t care! Probably the models can be adjusted for a little ice age according to the statement of the scientist 1979. Well! We’ll need it. The new GISS data is really horrible. It can’t be the sun! Good luck with the new model. Create an exception state for frozen northern and southern hemisphere. It’s a few more ppm CO2, remember. Absolutely, the models have predicted the pattern the last 50 years. Great work! How can you change your models after one statement from a scientist due to a delay in heating? The models will allways be with you, but a little afterward, or? What does the model (models?) say about the 0.75 degrees C drop of the GISS temperature between january 2007 and january 2008? Dr. Weart, many thanks. I’ve been noticing new pages at the AIP History site (unless I’d just missed them) and really continue to appreciate your work. I simply don’t understand the title of this blog “We Knew That”. I just looked at the IPCC AR4WG1 Summary. On Page 15 it shows Projections of Surface Temperatures. 2020-2029 show the Antarctic Warming by up to +1.0C. 2090-2099 shows a Warming in the Antarctic of around +3.0C to +4.0C. Nowhere in this latest projection map from the IPCC, which I assume are from model precictions, is any cooling shown? I’ll have to check what the 2001 and 1995 reports say regarding this. This is true, …, but, current IPCC-models (AR4) do predict a decrease in sea ice even for the late 20th century, which obviously did not happen. Even more, I have the impression that the sea-ice simulations for the period 1979-2007 are as much of in the Southern Ocean as in the Arctic Ocean, but in a different direction of course. More information can be found in Lefebvre and Goosse (2008) (sorry for the selfpromotion). Complete reference: Lefebvre W. and H. Goosse, 2008b: Analysis of the projected regional sea ice changes in the Southern Ocean during the 21st century, Climate Dynamics, 30, 59-76, DOI 10.1007/s00382-007-0273-6. We only need one argument, though there are, of course, many more. If you do the right sort of analysis of world temperature anomaly against time over the last 30 years or so, it is clear that temperatures have gone through a shallow maximum, and the temperature/time graph, as of now, is negative. This despite an unprecedented rise in the concentration of CO2. The effect, to me, is clearly not due to random changes in weather. This means that either CO2 has no effect on temperature, or some other climate effect is over-riding the effect of CO2. In which case, what is this other climate effect? the models say nothing about the strong La Niña episode that we know this time. We get the same situation in 2000. The temperature of the Antarctic Continental interior is likely to be dominated by the behaviour of the Southern Annular Mode. “Half-century seasonal relationships between the Southern Annular Mode and Antarctic temperatures” Marshall. Climate models say nothing about January 2007-January 2008, because they’re climate models. See all that red in Antarctica? That’s not projected cooling…. Chapter 11 on Regional Projections in the IPCC AR4 has a section on the observed and projected changes in the polar regions. Observations since 1936 (p.904) show a warming in Antarctica of about 2 degrees, projected to rise to 3-4 degrees by 2100. Page 857 shows projections from 21 models for the A1B scenraio – 1.4 to 5 degrees of warming from 1980-1999 to 2080-2099. I think this is different to your implication that models predict Antarctica will get colder. They dont. A better way to refute the skeptic’s argument might be to show that the Antarcic is not in fact getting colder, just warming slowly. As predicted by models. The known properties of greenhouse gases. The known increase in greenhouse gases. The observed warming and associated climate effects. There’s no warming; the surface temperature stations are wrong. The sun is causing the warming. Global warming stopped in 1998. Not a damn thing, since a sample size of two years is too short to be meaningful. There will be little jogs up and down; the trend is still up. 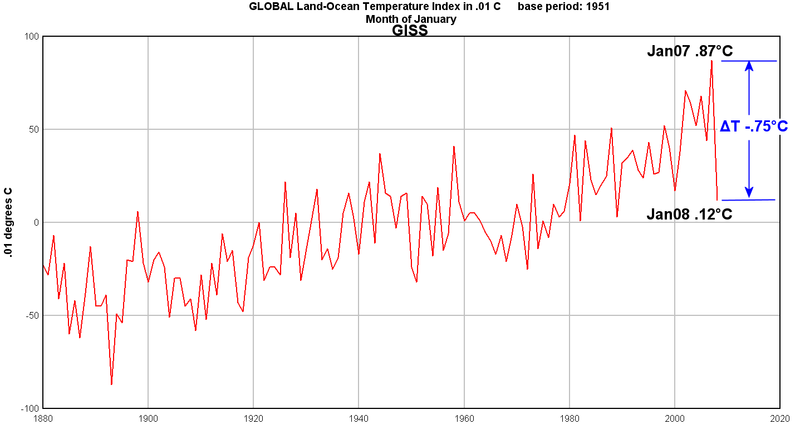 The January 2008 GISS temp is an anomaly of 0.12C from the 1951 to 1980 average baseline. Considering 1951 to 1980 was a cool period, that means the 2007 cool-down (La Nina induced) was a major event. Magnus, #15 and #16, I will give you the benefit of the doubt that you are not a native English speaker, because your take on this article is totally a product of your own fevered imagination. There is plenty of evidence for warming–and it is mostly from the Northern Hemisphere, as predicted by the models. So since the models are being verified by the evidence, explain exactly how there should be any talk of falsification? It’s interesting to note how slightly colder than average temperatures (such as currently observed in most of the northern hemisphere) seem to have much more immediate and significant negative impacts on human, animal, and plant populations than do warmer than average temperatures (it was minus 36C with a 20KM wind blowing straight into my parka hood this morning on my walk to work – bring on some of that warming or give me my money back!!). In addition to the aborbtion capacity of the ocean, there is a paper by Gavin and Drew Shindell on a study of which explores the decrease in atmospheric ozone levels and its impacts on Antarctic surface temperatures,which corroborates the reasons for the present cooling. Scroll down a little more than halfway down the page for and an abstract of this article and access to the full article. The title of the report is “Southern Hemisphere climate response to ozone changes and greenhouse gas increases.” by Drew T. Shindell and Gavin A. Schmidt. TREND: Ocean currents, global warming and wind combine to leave the Arctic ice fragile. New data this winter on Arctic winds and currents indicate that next summer’s ice loss at the North Pole may be even greater than 2007’s record-setting shrinkage. The last remnants of thick, old sea ice are dispersing, and the unusual weather cycles that contributed to last year’s loss of ice are continuing, a climatologist told an Anchorage conference Monday. “The buoys are streaming out,” said University of Washington climatologist Ignatius Rigor, referring to the satellite-tracked markers used to monitor the flushing of ice into the North Atlantic. Such a pattern preceded last summer’s record ice loss but was not expected to continue so strongly. Scientists are watching the polar ice closely, trying to sort out the effects of global warming and natural cyclical changes. Why is nobody catching this key point, it has been termed “Global Warming” for a reason– because the models predict warming across the globe. Interesting how one of the favorite “we hate the French” stories making its way through the blogosphere a few years ago highlighted the fact that tens of thousands of people died during an intense heat wave in France about a decade ago. Re #25: It is a fallacy to presume that all GCM runs have the same purpose. You need to provide more context than “Hansen”. That said, the map is pretty much neutral in the Antarctic interior, in agreement rather than disagreement with the historical prognoses Weart mentions. One gets the sense that MattN is trying to jump from a perceived modest disagreement between Weart’s summary and a GISS model run to a conclusion that there is no greenhouse effect to worry about. For context, it is fairly clear that the output referred to is obtained from http://www.climateaudit.org/?p=2665 , context therein makes it clear that these are model predictions from the 1980’s, and that the purpose of bringing them up is to nitpick about Hansen’s testimony to congress at that time, and not to discuss Antarctic dynamics. Politics aside, one shouldn’t stress the results of coupled climate models from 1988 too much, though. Although I am concerned that progress in climate modeling has slowed down, the decade from 1988 to 1998 was a period of enormous progress in climate modeling. Whether Hansen’s 1988 testimony was impeccable or not might affect your opinion of him, but it will not change the dynamics of the climate system a bit. It’s the climate system, not Hansen, we need to think about. Please take note of what Dr. Held says above in #14. We don’t know the dynamics of the ice shelf very well. Rapid ocean warming in the vicinity of the West Antarctic Ice Sheet (notably Thwaite and Pine Island glaciers) could have very serious global consequences. Further investigation of this matter is important. Twenty year old projections about it are not. The uncertainty about the Antarctic coastal area is very important both scientifically and from an impacts point of view, but it’s a small part of the whole picture. What Weart’s article says is that it is not a great surprise that the temperature signal from Antarctica is ambiguous, no more and no less. Satisfactory models of the coupling between the Antarctic ice sheet and the rest of the climate system do not yet exist. As it becomes sadly and perhaps tragically clear that we are not going to avoid a large perturbation to the system, this becomes much less of a purely academic question than one might hope. I believe the position is that much of Antarctica is not expected to warm any faster than any other parts of the globe. Certainly, parts of it have cooled, while the Antarctic Peninsula is the fastest warming area on Earth. I have asked many times and never received an answer here: What behavior of the climate system would contradict models of global warming? Specifically what behavior of what variables over what time scales? This should be a simple question to answer. They are not substantially different. In particular, note the reddest parts on earth. Global warming is a fact of life. What may be still in dispute is if human activity has caused this, or is adding to it. I read an interest article, cannot remember where, that NASA scientists had spotted evidence of similar warming on the planet Mars by comparing some of the earlier photographs of its surface with some of the latest photographs. It has been suggested that this may be caused by the Sun warming up, and also the cycles of Sunspots. The logic then dictates that if Mars shows certain evidence of the Global warming phenomena, then surely the same effect could apply to our own planet Earth — ie: the Sun warming up which may be part of the equation as well. With the new observations in hand, model improvements are underway. Science at work! What do you consider to be the 3 most compelling arguments commonly used to support anthropogenic climate change? I assume you mean: compelling to the general public, not scientists. In that case there is one compelling argument, no science required: the well-documented dishonesty and character flaws / attitude problems of its detractors. Fake credentials, being on the take, using deceptive letterheads, deceptive names-dropping, foul language, continuing to repeat long-debunked falsehoods, and inability to apply basic statistical methodology (is stupidity a character flaw?). And with some denialist scientists who should know better, the use of populist “arguments” like “they cannot even predict the weather one week from now…” are a dead giveaway. The problem with scientific arguments, even strong ones, is that people without a science background don’t find those compelling ever — they just yawn. And by the time there are compelling arguments of a more practical nature — as there will be! — it will be late in the game. 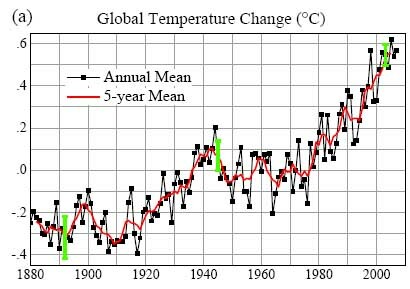 How about average global temperature records over the past century? If the graph descended at the same rate that it actually increases, that would be compelling evidence that the models are wrong. Similarly, if greenhouse gas concentrations rise in a business as usual scenario and the average global temperature over the next 30 years or so shows a consistent decline, when suitably smoothed and there is no obvious explanation such as a series of major volcanic eruptions on a global scale, then we could conclude that the models were not sufficiently reliable to base policy on. Of course, after 30 years, Pielke could ask the same question again. More important, it is not a simple question to answer. The climate system is very complex. So there can’t be a simple way to establish the validity of any model of that system. That is why the IPCC Reports devote entire chapters to questions of evaluations and validation. It is interesting that the same argument is often made against evolution, i.e., that it is a theory which is not falsifiable. Of course there are many observations which could falsify it, but such observations don’t exist. In fact, any scientific theory is not falsifiable in the strict sense. Scientists will always try to rescue a theory which has been very successful when presented with seemingly contradictory evidence, and that may require some incremental modifications of the theory. Usually they succeed, but on occasion they don’t, and we have a scientific revolution. And of course, often observational data which seems to contradict a well supported theory is wrong. Steven Weinberg has described how he once wasted a summer trying to reconcile his theoretical predictions with the latest experimental results in high energy physics only to discover at the end that the observations were faulty. A scientific theory will be abandoned if in balance it is inconsistent with observations. In the long run we will know how reliable climate models are. If, in fact, there are some fundamental reasons why climate models can never be sufficiently accurate to act as a guide, we should discover it. but it won’t be through a simple test. If Pielke wants to contribute constructively to this area of science, he should become a climate modeler himself and discuss such questions in the scientific literature. Otherwise, unless he can present some strong reason for doubting the competence or objectivity of people who do such work, he should listen to people who do work in the area. By “the right kind” of analysis do you mean a statistically invalid one? Because the only meaningful fit to that data is a linear one going up. Or that your analysis is wrong. The temperature have plunged down 0.75 C the last year. This is not shown in that post with data to mid 2007. Actually it has plunged down since October, on the northern hemisphere where there is snow record since 1966 and in Asia lots of 50- and 100 years record low temperatures. The temperature is now close to the late 1070th and if this is a trend the AGW has problem, don’t you see? Weather is one building block of the climate and the annual temperature is of the same unit as climate (degrees F/C/K/…). If the global temperature now plunge down we need an explanation for this. (El Nina, yes; but it’s weak compared to El Nino, and these phenomenon partly redistribute temperature.) Carbon dioxide isn’t one, but the sun activity is one which also has co-varianced well with decadal temperature in the past (with about a delay of about an 11 year suncycle). We can also compare the temperature the years near 2008 with those 30 years ago, and the difference isn’t large anough to be according to the models. Also models are used to, and the construction of the climate models really includes weather! But the knowlwdge of what is driving climate is very weak. I think they are sure about only 3 out of 9 factors and no long term predicting model can be accurate, since the instability and uncertainty of a model incrase exponentially in time. This uncertainty even with very good knowledge about driving forces! Certainty in the IPCC models is based upon lots of axiomatic assumptions in the rules of the model in order to give a “certain” result. And you can also check the temperature limits for certain periods of times in the models 2010-2019 or 2090-2099, and this decade we are well below the models. First I don’t talk about the stagnation of 2002 and 2003 which they think has been prolonged, but a plunge into colder temperatures the last monthes. La Nina is strong but no “ElNino-98”. It also shal partly redistribute temperature, not cool it like this. Still cosmic ray and clouds covariance (with 99 or acove 99.5 % significance according to Palle/Butler/O’Brian). We’ll see wha happens, but we are not within the predictions of the models as long as the temperature of the latest month continues or even drop. You have to admit this, and you have to show strong evidence for that La Nina cooling as well as disprove Palle/Butler/O’Brian. Good luck! BTW it’s smart to focus on the Antarctica now, bvecause of the climate oscillation between the northern hemisphere and southern pole. Great work! Sustained global cooling would contradict it. But we’re not seeing that. Greater warming at the equator than at the poles would contradict it. But we’re not seeing that either. Greater warming during the day than at night would contradict it. But we’re not seeing that either. Greater rainfall in continental interiors would contradict it. But we’re not seeing that either. Milder weather along coastlines would contradict it. But we’re not seeing that either. Treelines moving toward the equator would contradict it. But we’re not seeing that either. Increasing arctic ice coverage would contradict it. But we’re not seeing that either. [[ I read an interest article, cannot remember where, that NASA scientists had spotted evidence of similar warming on the planet Mars by comparing some of the earlier photographs of its surface with some of the latest photographs. It has been suggested that this may be caused by the Sun warming up, and also the cycles of Sunspots. If the sun were brightening, all the planets would be expected to warm by the same amount, all else being equal. But Earth, Mars, Triton and Pluto are warming by unequal amounts, and Uranus is cooling, and Venus may be cooling, and Luna and Mercury are unchanged. That would be kind of hard to achieve with increased sunlight. It would really be nice to have a threaded blog, especially now that this site is popular enough to sometimes get hundredst of responses to blog entries. Science is a process of perfecting your models, and denying your mistakes like this blog entry does does little to lend your arguments credibility. Early GCMs got the temperature change in the interior of Antarctica badly wrong, prediciting large temperature increases by the present time. They also got the temperature change in the Antarctic Peninusla badly wrong, seriously underestimating the temperature increase there. Both of these problems were due to a failure to account for the ozone hole, which was not understood when the early GCMs were made, and continued to be poorly represented in many models for a long time. With the ozone hole added, the annular mode of Antarctic circulation strengthens and locks cold air in the interior of the continent. Models with the ozone hole added do a good job of prediciting the recent temperature trends of Antarctica in recent decades. Even taking this into account, however, the Southern Hemisphere as a whole has been anomalously cold for the past few years, and the Arctic has been anomalyously warm. The response from this site has been that this the models have it right, and this is only an extreme (for the Arctic at least) anomalous weather event and we shouldn’t read much to significance into it. It may be so, but a serious discussion of the anomaly should include looking at the probability of a similar event happening in the current GCMs, and looking at those model outliers which match the current ocean SST and sea ice, and looking at whether the Southern Hemisphere is anomalously cold with high sea ice during an extreme summer Arctic sea meltoff. “Yeah, we new that,” is not a serious discussion of the significance (or lack thereof) of this cold anomaly. #43 Leonard Evens tells us that it will take 30 years of declining temperatures before he would even begin to doubt the validity of the current climate models. He is certainly to be congratulated on demonstrating that he is indeed a true believer, but do the rest of us really expected to have to suffer all the negative consequences of carbon-reduction policies for 30 years before we are allowed to be sceptics? Well, except that Mars and Earth really aren’t all that similar, are they. Earth has oceans. Mars doesn’t. Earth has biology. Mars? Nope. Actually, the observations you are referring to showed some evaporation of CO2 ice at Mars’ southern pole, I think. The reason is because there have been a lot fewer dust storms on Mars of late, thus allowing more sunlight to sublimate the CO2. Nice try, but we can measure sunlight. It’s not increasing.